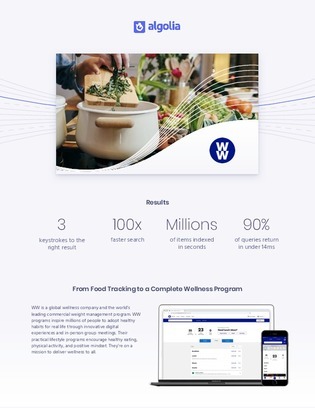 How did WW, a global wellness company, transform their member’s digital experience? In this case study, explore how Algolia redesigned WW’s user experience through a comprehensive analysis of WW’s programs, platforms, and technologies to deliver a personalized CX through search technology. Learn more about how WW configured their search relevance to allow members to find the items they’re searching for in as few as 3 character strokes.